Sooooo I am v excited to share this recipe with y'all because it's only slightly adapted from one in the new cookbook written by one of my all-time fave vegan bloggers: The First Mess Cookbook by Laura Wright. Laura's blog - The First Mess - was one of the places I found inspiration in when I initially began getting into food photography and blogging several years ago (*waves back at 2011 self*). Her photos are always so stylish, lovely and minimalist: they tell a story that I wanna know more about. Laura's recipes are also consistently A+, I'll add. She is a legit chef so you know SHE knows what's going on (I, on the other hand, rarely do). As far as vegan food photography bloggers go: Laura, and Ashleigh from Oh, Ladycakes, are pretty much my heroes. Now that I am done gushing, I'll talk about the recipe. 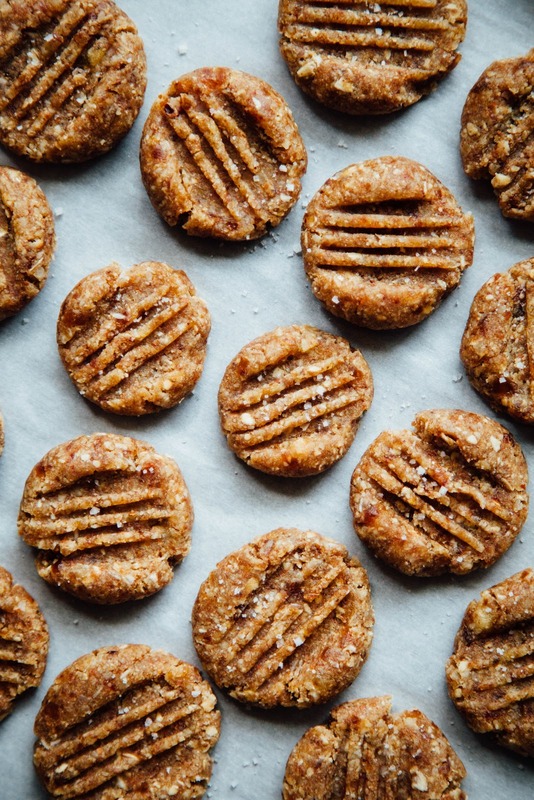 It's a super simple raw cookie made up of - you guessed it - mostly nuts and dates! Somehow it never gets boring. Basically all my recipes are various combos of nuts and dates. 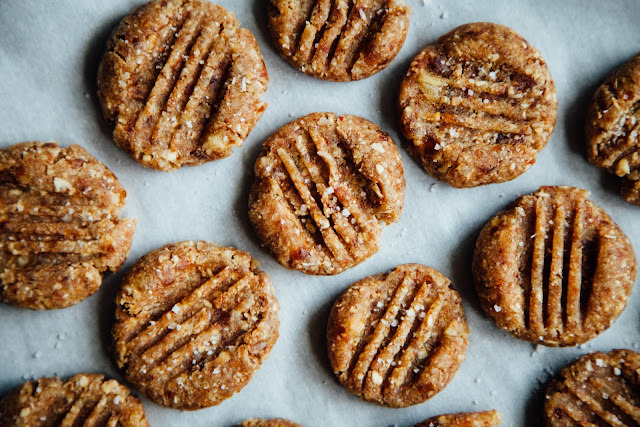 I use almond butter in this recipe but Laura's original version uses peanut butter, FYI. At the moment I am just seriously into almonds. I love Laura's addition of fresh lemon juice; it's something I would not have thought to do but it takes the cookies to the next level by adding some lightness. 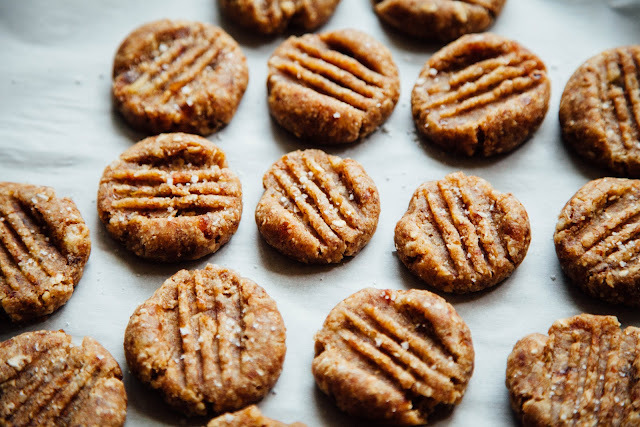 These cookies are soft, a lil bit chewy, a lil bit gooey? and a lotta yum. They are perfect for any time. Please eat as many as you like because doing what makes you happy is really what life's all about. In a food processor, grind the almonds into a rough flour. Add the rest of the ingredients and process until you have a thick dough that clumps together. Roll your dough into balls, then flatten into cookies. Sprinkle with some more sea salt if you like. Keep in the fridge for up to 10 days. But trust me: they'll disappear much faster than that.